Every tooth is made up of two parts: the crown that is above the gum line and the root that is below it. Needless to say, they aren’t completely separate and what happens to the crown can certainly impact the root. That’s why a dental crown is such an important restoration. If you have a tooth that is severely damaged by decay or a traumatic injury, then a dental crown may be just what’s needed to protect the remaining tooth structure both above and below the gum line. Dr. Goodman often uses dental crowns to help strengthen and protect a damaged tooth, so you can still have an attractive smile with all of your own natural teeth. Years ago, dental crowns were only made of metal, like amalgams made from silver or gold. Obviously, these were quite noticeable when you smiled, spoke, or ate. Today, Dr. Goodman can use all-porcelain or all-ceramic crowns. Thanks to advances in the manufacturing of these materials, they are equally as strong and durable as their metal predecessors. You’ll probably only need to schedule two appointments that are about two weeks apart for a dental crown procedure. After the local anesthetic has taken effect, Dr. Goodman will begin to prepare the tooth at the first visit. This involves removing any decay as well as a portion of the tooth structure along the biting surface and sides. By reshaping the sides of the tooth, the crown is able to fit comfortably between the teeth along either side; removing some of the biting surface ensures that the crown won’t feel high when you bite down. 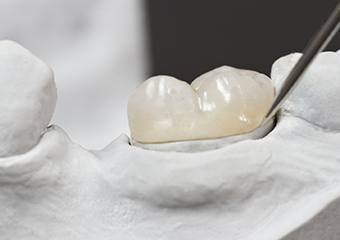 Once the tooth prep is completed, we take an impression that is used to immediately give you a temporary crown. This same impression is then sent to a special dental lab where the permanent crown is hand crafted. In about two weeks, your new crown will be ready to replace the temporary. If you need a dental crown in Columbia, TN near Mt Pleasant, Culleoka, and Spring Hill, contact the office of Dr. Alex Goodman.